Here is an update about one of favorite yachts, the 65-foot trimaran Promenade. Promenade has had a very busy season this winter. They have a nice spot open at the beginning of June but then they are booked solid for 8 weeks, June 14 through August 1, 2014. with a hold on August 3-9. Promenade is chartering all summer in the Virgin Islands and we hope you will take advantage of our special summer offer. 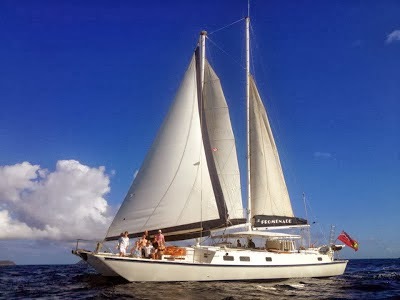 Paradise Connections is offering a 5% discount on new Promenade bookings with charters taking place between August 10 and October 25, 2014. We always advise trip cancellation insurance in case one of those pesky named storms pop up in our neck of the woods. None last year... Hurray! HOLIDAYS: Are you looking for a spacious, fun boat for up to 10 people that offers diving (dive instructor) for the holidays? Book soon as there aren't many boats that can offer so much and they book up quickly. Christmas is open and can end as late as Saturday, December 27. Those are excellent dates. New Years (Sunday, December 28-January 4) has a hold but we may challenge the other group for their dates... inquire. I spent 5 nights aboard Promenade (aft Queen cabin) in November while attending the Tortola and St Thomas Charter Yacht Shows. I found the boat very comfortable and the excellent crew very hospitable. Promenade is one of our favorite charter yachts. There's lots of things to do aboard Promenade: diving, snorkeling, kayaking, waterskiing, fishing, kneeboarding, tubing, banana riding, standup paddle boards, dancing with disco lighting and DJ booth, "power lounging", watch DVDs inside or outside, hiking, beachcombing, yoga on the beach, listening to tunes, or just chilling out... PLUS, ask nicely and they might just share some homemade ice cream with you! 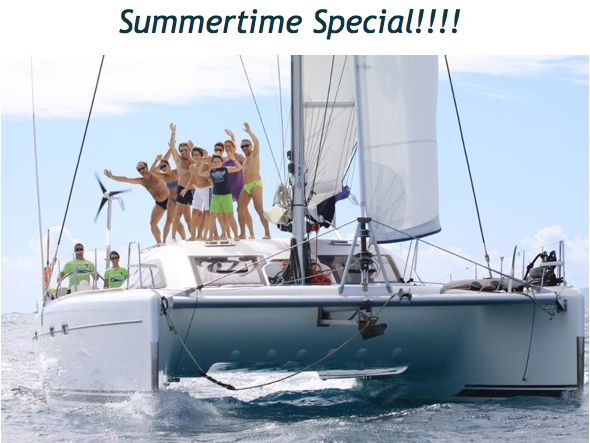 Come sailing on the Catamaran Nemo this summer and take advantage of their summer sale! SPECIAL OFFER: The charter yacht NEMO, a 47-foot Nautitech catamaran, is offering a 10% discount off their standard rates for Caribbean yacht charters taking place in June and July 2014. Enjoy sailing and great food with Valentina and Andrea on Nemo. Amenities include: a 12-foot dinghy with 15HP motor, tube, two-person kayak, standup paddleboard (SUP), snorkel gear, TV/DVD in salon, iPod dock, hammock, trolling fishing gear, etc.